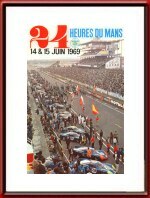 Vintage 1969 Le Mans Race Poster. June 14 & 15, 1969. This poster is part of the so-called "Modern Photographic Approach" era in Le Mans posters which lasted from 1964 - 1971. The layout and production of this poster were in the hands of Imprimerie Oberthur who realized this poster based on a color photograph, by Andre Delourmel, of the line-up before the start of the 1968 edition. Despite social unrest at that time, still a huge crowd tuned out and the focus of the poster is on the 9-car strong Alpine-Renault team. The race was won by Jacky Ickx and Jackie Oliver in their # 6 Ford GT 40 (S/N 1075) with a total of 372 laps to their name. 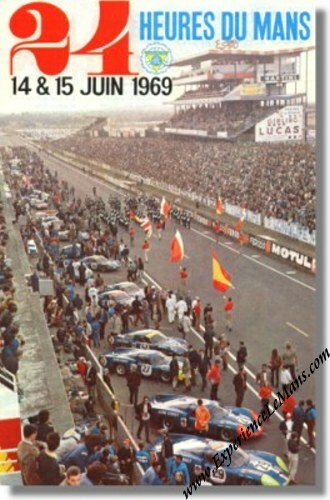 For the full results of this race, please see 24 Heures du Mans results 1969.